It is always a wise choice to transfer photos from iPhone to flash drive. For one, backing up photos to an external hard drive helps to prevent permanent loss. Another reason is that with the photo backup in flash drive, you can remove them from iPhone to save space for more new photos. It is necessary to transfer photos from your iPhone/iPad to flash drive to ensure you have a safe backup and also facilitate the management of iPhone’s memory. Thus, if you want to transfer pictures from your iOS device to flash drive, this guide is for you. iMyFone TunesMate iPhone Transfer is an all-in-one solution to manage the photos in iPhone or iPad easily. It also offers you 1-click function to transfer files. Of course, it can not only manage photos, but also freely transfer files between iPhone and computer/flash drive, including music, movies, podcasts, audiobooks, playlists, iTunes U, albums, etc. 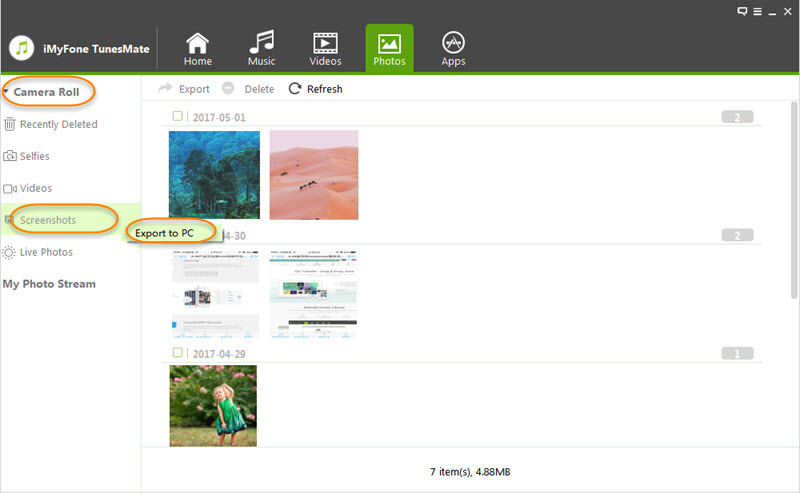 Manage HEIC Photos: View HEIC photos for free; Transfer or delete HEIC photos. Transfer photos or albums (not just photos) to computer folder or flash drive, which supports photos in photo stream and camera roll. Transfer to/from iPhone: Transfer files to iPhone from computer, iTunes, flash drive, etc. ; Extract files from iPhone, including purchased and non-purchased files. Transfer to/from iTunes: Enrich iTunes library from unlimited iDevices even in different Apple IDs; Sync iTunes library to iPhone without erasing. Step 1: On your PC/Mac, open iMyFone Tunesmate and connect your iPhone and flash drive. 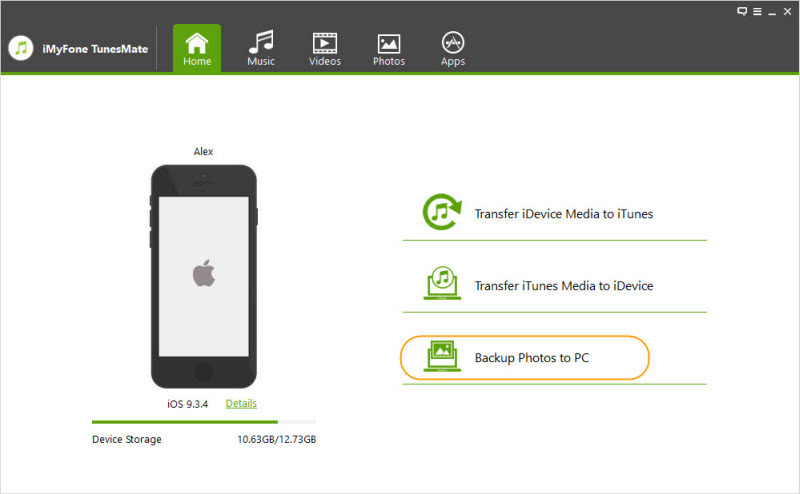 Step 2: Tap Backup Photos to PC/Mac on the TunesMate interface. Browse and choose your flash drive and click Select Folder to begin. Step 1: Open iMyFone TunesMate and of course connect your iPhone and flash drive. Step 2: Go to Photos tab at the top and all your albums will be listed at the left sidebar. Step 3: Right click on the album that you want to transfer and click on Export to PC/Mac. Choose your flash drive and hit Select Folder to begin. Apart from the method mentioned above, you can download iPhone photos and then export them to your flash drive on your PC or Mac with iCloud. Use the following steps. Step 1: Activate the iCloud sync feature for photos on your iPhone/iPad by going to “Settings > [your name] > iCloud > Photos” and turning on “iCloud Photo Library”. Step 2: On your PC/Mac, log in on iCloud.com or iCloud program using your iCloud account. Step 3: Click on Photos and wait a while till all images are loaded. Step 4: Choose the photos you want to export and tap Download selected item button. This may take some time if the pictures are many. Step 5: Connect your flash drive to your Windows PC/Mac and copy all images to your drive. You can delete the pictures from your PC if you don’t need them. 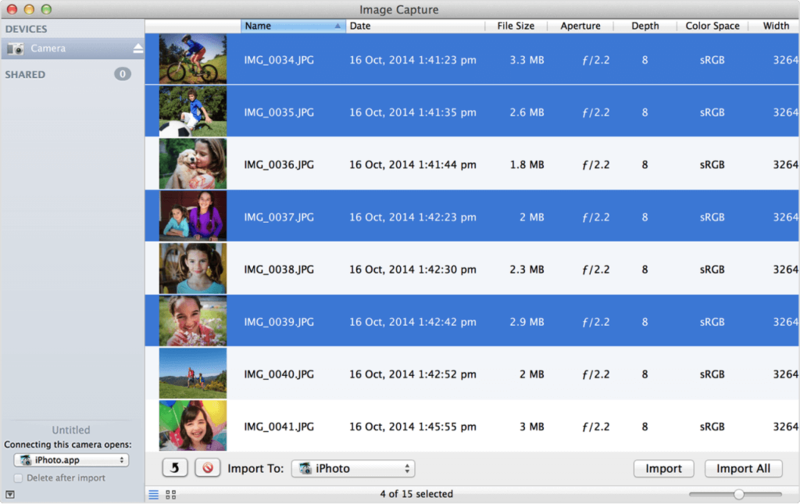 You can transfer iPhone photos to flash drive using the default program on Mac or Windows PC. However, this method only works on Photos in Camera Roll. The two methods above can be used for downloaded photos and app photos. Step 1: Connect your iPhone/iPad to PC. For Windows 7, AutoPlay window will pop up. 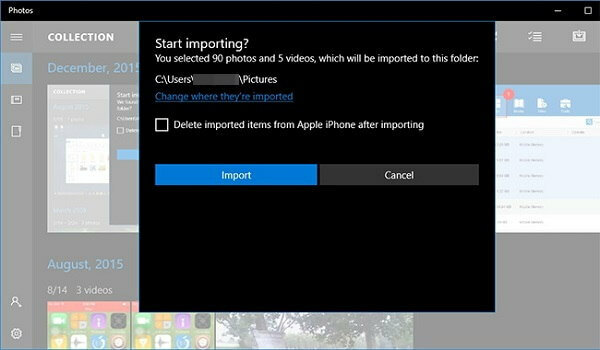 Choose “Import pictures and videos using Windows”, then tap Import to transfer the Camera Roll photos to your PC. For Windows 10, launch Photos app and press the Import button. Step 3: Plug your flash drive to and transfer iPhone photos from PC to the flash drive. Step 1: Connect your flash drive and iPhone to your Mac. Step 2: Search for Image Capture to start the program. Step 3: Tap the name of your iPhone and the entire picture on your device will be delayed. Step 4: Select your flash drive on the Import To bar as the output destination. Step 5: To transfer your desired pictures, check the photos and then click Import. If you want to import all the photos, tap Import All.